Social media is the in thing right now, and no social media site is larger or more popular than Facebook. With your Droid X, you can keep track of your Facebook friends wherever you go. To use Facebook on your Droid X, you must have a Facebook account, which you’ll want to set up from a full-sized computer. After you have your Facebook account set up, you can set it up on your Droid phone and get to Facebooking. From the Home screen on your Droid, touch the Launcher button. If you see a Facebook account listed, you’re done. Otherwise, continue with these steps. Touch the Add Account button and choose Facebook. Touch the Email text box and type the email address you used to sign up for Facebook. The onscreen keyboard appears when you touch the text box. Touch the Password text box and type your Facebook password. The characters you type turn into big dots so that no one looking at the phone can see your password. The Droid X signs in to your Facebook account. If prompted, touch the OK button to dismiss the Picture Source message, then touch the Done button. You can now use the Social Networking app on your Droid X to review status updates and messages from your Facebook friends. 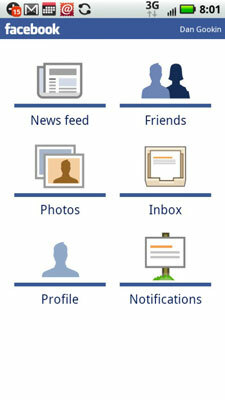 To visit your Facebook account on the Droid, open the Facebook app, which appears in the Applications Tray. The main Facebook screen appears. It’s a rather simplistic interface, but it’s where you can check most of the things you do on Facebook, including uploading a photo or keeping your status up-to-date wherever you go with your Droid. To update your Facebook status choose either News Feed or Profile, then type or dictate your status in the Status text box. Your Facebook friends see your status update instantly, plus they see the tiny Mobile icon appear next to your status update, so they know you made the update by using your cell phone. This switches the Droid X over to camera mode. Touch the Shutter button to snap a picture. If you aren’t happy with the results, touch Retake or Cancel and try again. You might have to scroll the window down a bit to see the text box where you type in a caption. Touch the Upload button to send the picture you just took to Facebook. 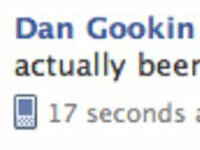 In a few moments, the image is uploaded to Facebook.